Huckleberry is rich in antioxidants and is used as a culinary fruit in herbal medicinal preparations. Taking antioxidants, such as Huckleberry herbal extract, during pregnancy may help protect your body from oxidative damage and keep you and your baby healthy and strong. Bilberry may be useful in treating atherosclerosis, the oxidation of LDL, or bad cholesterol in the bloodstream, which forms blood vessel blocking plaque. It is said to protect and strengthen the capillaries in the eyes and found to be particularly useful for people who suffer from eyestrain, nearsightedness or poor night vision. Glaucoma.org describes the Huckleberry as one of the alternative medicines to treat glaucoma. Along with strengthening the circulatory system, Europeans have used Huckleberry for thousands of years to treat diarrhea. Applying Huckleberry extract directly inside the mouth treats mild soreness in the throat and mouth. Huckleberry is also a treatment for chronic fatigue syndrome, hemorrhoids, menstrual cramps, diabetes, arthritis, gout, skin conditions, kidney disease and urinary tract infection. The extract of Huckleberry is useful in the treatment of macular degeneration, diabetic retinopathy, and cataracts. According to the National Center for Complementary and Alternative Medicine, Huckleberry is used in a number of circulatory problems, including venous insufficiency, angina, thrombosis and varicose veins. Treatment with Huckleberry supplements may keep your heart healthy by improving blood flow to the heart. This herbal supplement also helps keep your blood vessels strong and may help reduce your risk of developing atherosclerosis, a condition in which fatty plaques accumulate along the inside of your blood vessels. This condition can lead to heart attack and stroke. Huckleberry helps to improve circulation and protect against circulatory disease as well as, lower blood pressure and blood sugar. Because Huckleberry fortifies capillaries and strengthens veins, it helps to improve blood circulation by increasing the ability of fluids and nourishment to pass freely and is, therefore, also valuable to people, particularly the elderly, who suffer from poor circulation to the hands and feet. Huckleberry has been used to treat chronic venous insufficiency, a condition that causes leg swelling, varicose veins, leg pain and skin ulcers. Huckleberry also has potential uses in treating bruises and hemorrhoids. Huckleberry has a traditional use for regulating blood glucose in people with diabetes. Research has shown this herb to be useful in the treatment of retinopathy, the damage that can occur to the retina of the eye due to chronic high blood sugar or high blood pressure. Huckleberry may be beneficial for treating or slowing the progression of macular degeneration and retinitis pigmentosa. 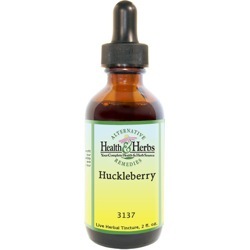 Huckleberry has been used traditionally for treating nearsightedness, eyestrain and poor night vision. Huckleberry herbal extracts may also help prevent (and stop the worsening of) cataracts. The beneficial activity of Huckleberry is mainly due to components called anthocyanins, according to the Memorial Sloan-Kettering Cancer Center. Anthocyanins have anti-inflammatory properties and protective effects on blood vessels. The herbal extract also has antioxidant properties, and they scavenge free radicals, harmful substances in the body that can cause cell damage and disease. Huckleberry herbal supplement has been used to treat diarrhea, according to studies done at the University of Maryland Medical Center. The tannins act as an astringent that helps to constrict and tighten intestinal tissues, and as anti-inflammatory agents that reduce intestinal inflammation associated with diarrhea. It is an antiseptic that helps treat urinary tract and bladder infections and is said to curb intestinal putrefaction (which produces flatulence and gas), helping to reduce stomach cramps. It has also been used in cases of gastroenteritis that occurs in connection with such disorders as Crohn's disease and infection by such pathogens as Helicobacter pylori, the bacterium related to a peptic ulcer. Applying Huckleberry liquid herbal tincture directly to the inside of the mouth treats mild soreness in the throat and mouth. Huckleberry does contain tannins, which reduce swelling. The anthocyanins have demonstrated anti-elastase action work very powerfully against free radicals. The cosmetic application is due to the herbs ability to stimulate circulation. It has been used as an astringent in eye care and used externally to treat wounds, sores and skin ulcers. Ingredients: Huckleberry, Structured Water, 20% Alcohol. Non-Alcohol: Huckleberry, Structured Water, Vegetable Glycerin. Instructions: Use 6-12 drops in juice, water, under the tongue, or as desired. May be taken 3 times daily. Store in cool, dark place. Keep out of reach of children. Contraindications: Currently, there are no warnings or contraindications with the use of Huckleberry. However, coumarins in Huckleberry may increase bloodthinning activity and inhibit platelet activity. From Katrina of Missoula, Montana on 5/1/2016 .